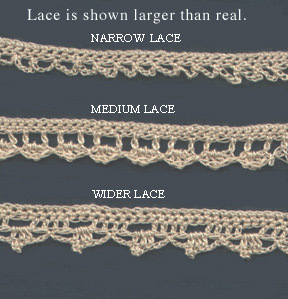 The real scale: Narrow Lace = 3/16" wide, Medium = 1/4"and Wide = 3/8"
@ GW 2002 Use of instructions for personal use only. Instructions not to be duplicated or used in other instructions. May be used on items you make to sell however. Make a chain for desired length of lace, add 10 stitches for shrinkage, turn. Row 1: Sc in each ch st, ch1, turn. Row 2: Sc in each ch st, turn. Row 3: *Chain 6, sk 1 st, sl st in next st**, repeat from * to ** to end of row. Cut thread and finish. Row 1: Sc in each ch st, continue to end of row, ch 1, turn. Row 2: Sc in each sc, continue to end of row, ch 4, turn. Row 3: Sk 1 sc, dc in next sc, *ch 1, sk 1 sc, dc in next sc**, repeat from * to ** to end of row, ch 3, turn. Row 4: Tr in first sp, 1 dc in same sp, sl st in next sp, *1 dc, 1 tr,1 dc, in next sp, sl st in next sp **. Repeat from * to ** to end of row. Cut thread and finish. Row 1: Sc in each ch st to end, ch 1, turn. Row 2: Sc in each st to end, ch 3, turn. Row 3: 1 dc in each of the next sc, *ch 2, skip 2 sc, dc in next 4 sc**. Repeat from * to ** to end of row. dc in same sp, ch 3, sl st in center of block,** Repeat * to ** to end of row. Cut thread and finish.